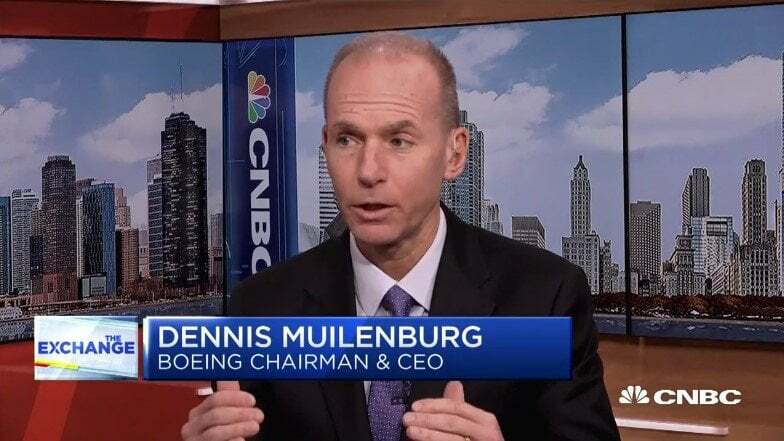 The following is the unofficial transcript of a CNBC EXCLUSIVE interview with Boeing CEO Dennis Muilenburg and CNBC’s Phil LeBeau on CNBC’s “The Exchange” (M-F 1PM – 2PM) today, Wednesday, January 30th. KELLY EVANS: Welcome back. The story of the day is Boeing, after its results this morning came in much better than expected. The company’s shares are up more than 6% right now and trading just below their all-time high. It’s giving a major boost to the Dow and suggesting China hasn’t hurt the company nearly as much as thought, at least yet. Our Phil LeBeau is live now with the CEO. Phil. PHIL LEBEAU: Thank you very much, Kelly. Dennis Muilenburg, Chairman and the CEO of Boeing. Huge day. You beat the street by almost 90 cents. This has people saying: what did the analysts not appreciate about the execution in the fourth quarter? Because you’re blowing away what they were expecting. DENNIS MUILENBURG: Well thanks, Phil. Appreciate that. Proud of our team’s work. I think what you see reflected here is a strong growth in the aerospace industry and the market place, and then the way we’re leveraging that growth as we ramp up commercial airplane production. We’re driving bottom-line profitability and cash flow while we’re doing that. And we’re also seeing fundamental strength in our defense business and our services business. So this is really a star of all three business segments really performing, driving both top and bottom line growth. PHIL LEBEAU: You’ve got the execution performing fantastically, especially in the commercial airplane business where you have revenue topping $100 billion on an annual basis. First time ever. Yet at the same time, as you ramp up production of the 737 up to 57 a month later this month, there were some questions on the analyst call about the engine maker CFM and whether or not it can meet demand and what you have to do to assist that. Any concerns about that ramp up in production? DENNIS MUILENBURG: Well first of all, as you said, our revenue top line is growing fueled by the marketplace. So we see a market that needs 43,000 new commercial airplanes over the next 20 years, and much of that in our 737 production lines. So we’re ramping up 737 production and ramping up the 787 to 14 a month. In the 737 line, as we move to 52 a month and now 57 a month this year, we’re keeping a close eye on our supply chain. And there’s been some challenges there as we move up to 52 a month and as we prepare for the next step, really focused in on some key points in the supply chain - - CFM being one of those. Probably our most challenging area is just working engines. To me, this is all about production system health and synchronizing the supply chain. PHIL LEBEAU: Working closer with them? DENNIS MUILENBURG: Yeah, and we’ll be deploying additional Boeing assets there. And certainly the relationship between the U.S. and China is pivotal to us. So we’re very much engaged in the ongoing trade discussions. As I mentioned, the world needs 43,000 new airplanes over the next 20 years. About 7,700 of those are in China. So China needs the airplanes. It needs a lift to continue to grow economically and to fuel their broader economic growth across multiple sectors. Here in the U.S., it’s also important as we ramp up production and provide airplanes to China. It’s creating U.S. Manufacturing jobs. About 90% of our manufacturing jobs are here. And we create about an $80 billion a year trade surplus for the U.S. So both countries are interested mutually in a healthy aerospace industry. KELLY EVANS: Your stock trades often as the tell for how the U.S./China trade talks are going. With -- Those talks are ongoing in Washington right now. But often, see shares of Boeing – for as big of a company as you are, with as big a backlog as you’re describing – we see your shares whipping around by 5 or 6%, often up or down depending on how people think those trade talks are going to play out. Why are you being used as the ‘whipping boy’, if you will? About 10% of your revenue, as I understand it, comes from China. But how much really hangs on these trade talks for your company right now? DENNIS MUILENBURG: Well those trade talks are certainly important us to but we also maintain a long-term view. So you’ve seen some volatility recently and we’re going to continue to stay engaged in the trade talks. We do see some convergence happening. We think both countries are leaning forward, and we anticipate some successful conclusions to the trade talks. But we also have to maintain a long-term view. We today have a backlog of 5,900 commercial airplanes, roughly seven years of production. Now many of those are going to be going to China but again, we have this long-term view. So while near-term trade talks are important, they would change our long-term perspective here. Aerospace is a great long-term growth market. PHIL LEBEAU: At the same time, Dennis, though -- you hear the talk of a global economic slowdown. You are not seeing that in terms of demand. Let’s take a look at a chart that shows the global traffic in terms of the number of people who are flying. And your point is that you can’t get caught up in these near-term headlines, you have to look at the longer term trend. Right? DENNIS MUILENBURG: Yeah, Phil. That’s an excellent point and well stated. We’re seeing traffic grow at 6% to 7% a year as you can see in the chart. And this is a long-term sustained trend. It’s outstripping global GDP. And while GDP growth may be cyclical in some nature, the fundamental nature of traffic growth – passenger growth – has changed. We have new network city pairs. We have a rising middle class, especially in the Asia-Pacific region. All of that is fueling long-term sustained growth. There’s 150 million new passengers in Asia every year. 80% of the world’s population is yet to take its first flight. And that rising middle class is fueling long-term growth that outpaces GDP and it also creates sustained growth, not cyclical growth. PHIL LEBEAU: Last question. I want to talk about the autonomous personal air vehicle. Now you did a test flight of this vehicle last week, which raises the question: realistically, how far into the future do you think it is before we can say, “Sure, I’m taking an autonomous air taxi from point a to point b in Chicago or New York or Los Angeles” -- wherever it may be? DENNIS MUILENBURG: Well I think we’re going to see implementation of this technology – these autonomous vehicles -- in the early 2020s. I think it will be in small applications first, dedicated routes, places where we can certify these vehicles. I don’t think the technology will be the pacer here. As we’ve seen with flight testing, the technology is available. We’re moving quicker to prototype vehicles. The broader regulatory framework, certification, ensuring safety of the system and adoption by the public—those will be the pacing items. But it’s going to happen faster than many of us think. PHIL LEBEAU: And you’re working with Uber Air, but you make a point of saying it’s not just Uber Air. There are dozens of companies that are potentially looking at this? DENNIS MUILENBURG: There are literally dozens of companies. Different business models, different technologies. Our goal is to drive this forward and lead in this mobility transformation. Not only in terms of producing vehicles but also creating the infrastructure, the network, the control systems, the certification. Bottom line is, this has to be safe. And as we transform mobility for the future, I expect Boeing to be in a leadership position. KELLY EVANS: Wow. That’s amazing. I look forward to my flying personal private plane. Guys, thank you both so much. Phil LeBeau. Dennis Muilenburg. Dennis, by the way, Jim Cramer asked about this this morning: would you ever split the stock? He said it could go to 500. DENNIS MUILENBURG: We’re not planning on it. We’re focused on sustained long-term growth. You can see that in the market. You can see that in our business. And it’s going to be both top and bottom line. KELLY EVANS: Alright, just figured I’d ask. Great stuff, gentlemen. Thank you both. Really appreciate it. Dennis Muilenburg, the CEO of Boeing with our own Phil LeBeau.